Nikki Haley, U.S. ambassador to the United Nations, speaks during a Security Council meeting on North Korea's latest missile launch, Nov. 29, 2017, at United Nations headquarters in New York. Following North Korea’s latest and most advanced missile test to date, the United States has urged China to show leadership and do something it has so far been unwilling to do - cut off Pyongyang’s oil supply. Analysts said that while that option remains a step the Chinese still appear unwilling to take, it is something they increasingly need to consider. “The United States and China will definitely tighten economic sanctions on North Korea. It is unavoidable and North Korea deserves it, particularly given that its development of the Hwasong-15 [missile], raises the threat level toward the international community and the United States,” said Zhao Tong, a fellow at the Carnegie Tsinghua Center for Global Policy. Zhao said that when it comes to sanctions there is little room left. “Oil is something China will not take up lightly. Perhaps more restrictions can be placed on [North Korean] laborers [working in China] or they can be banned completely,” he said. China has already ordered the closure of North Korean businesses in the country and told Chinese companies they cannot hire new workers from the North or renew contracts. People watch a TV screen showing a local news program reporting about North Korea's missile launch, at the Seoul Railway Station in Seoul, South Korea, Nov. 30, 2017. Oil, however, has always been the one commodity Beijing has approached with extreme caution. Still, it is a question that China will have to carefully consider, said Jia Qingguo, a political science professor at Peking University. U.S. Secretary of State Rex Tillerson applauded China's efforts to curb North Korea's acts of aggression, but believed China can do more, particularly with respect to oil. “I think the Chinese are doing a lot. We do think they can do more with the oil and we’re really asking them to please restrain more of the oil, not cut it off completely," Tillerson said Thursday at the State Department. Speaking at the United Nations Wednesday, U.S. Ambassador Nikki Haley said Washington is looking to China’s President Xi Jinping to take a stand. “We believe he has an opportunity to do the right thing for the benefit of all countries. China must show leadership and follow through. China can do this on its own, or we can take the oil situation into our own hands,” Haley said. For its part, China’s Foreign Ministry said Thursday that it was still focused on denuclearization and getting all sides back to the negotiating table. Foreign Ministry spokesman Geng Shuang said China would continue to do everything possible to help reach that goal and that it would fully implement sanctions already approved by the United Nations. “China will completely and thoroughly carry out all resolutions regarding North Korea and its international responsibilities,” Geng said. 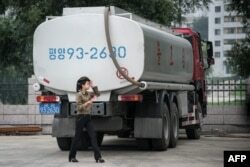 FILE- In this photo taken on July 21, 2017, a petrol station worker walks past a fuel truck in Pyongyang. In sharp contrast, however, comments in China’s state media about the latest test and sanctions were more direct, with some even putting the blame for the launch on the United States. 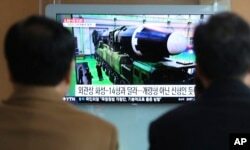 An editorial in the China Daily argued that the latest test may have been prompted by the Trump administration’s decision to label North Korea a sponsor of state terrorism. Beijing wants the two "belligerents" to calm down and is vexed that a golden opportunity to encourage Pyongyang into talks was "casually wasted" by the Trump administration, the paper said. "The clock is ticking down to one of two choices: learning to live with the DPRK having nuclear weapons or triggering a tripwire to the worst case scenario," it added. An article in the Communist Party-backed Global Times urged the United States to take what it called a more temperate approach. “It is time the U.S. realized that increasing and tightening sanctions already in place will not have the desired effect. Since yesterday, Pyongyang has never been this confident. 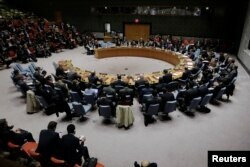 Condemnations from the U.N. Security Council and the new sanctions that may follow will solve nothing,” the article said. Members of the U.N. Security Council meet to discuss a North Korean missile launch at U.N. headquarters in New York, Nov. 29, 2017. Daniel Pinkston, a North Korea scholar at Troy University in Seoul, said that regardless of their impact, more pressure on Pyongyang is needed. And it is not just sanctions where cooperation is needed. Peking University’s Jia Qingguo said that in addition to tightening sanctions, China and the United States will need to find ways to cooperate in a wide range of areas. “If there is a crisis in North Korea, both sides have their own backup plans. These sorts of things are a part of that wider range of cooperation and should be discussed so that the United States and China can avoid military conflict,” Jia said. Daniel Schearf in Seoul and Joyce Huang contributed to this story.